Manchester United are on a mission at the SuperCupNI this summer. Down the years the Red Devils were serial winners at Northern Ireland’s world famous international youth tournament in its Premier section. Although they seldom contested the Junior event, they did make the final way back in 1994, losing out to Middlesbrough. So with confirmation of their inclusion in July’s Junior tournament, along with Southampton, Plymouth Argyle and Charlton Athletic, organisers can be sure of big crowds. 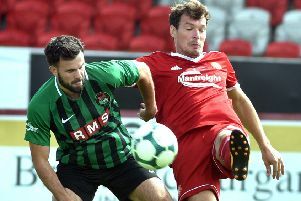 “United have won six of the 12 Premier finals they have appeared in which is quite a record,” said SuperCupNI public relations officer Jim Sandford. So many future stars have sparkled on pitches around the north coast from David Beckham to Marcus Rashford and Paul Scholes to Jesse Lingard. United’s last success in the Premier section was in 2014 when, with Rashford in their squad, they beat French side Vendee in the final. A second half headed goal from Cameron Borthwick-Jackson ensured they retained their title at Ballymena Showgrounds. Only Everton have matched United’s title success in a single section here, winning six of their nine Junior final appearances. In fact, the Toffees lifted the one-off U-21 title when they beat Celtic in 2016. United, though, mirrored that with an U-18 challenge success over a Northern Ireland Select at Coleraine last year. Southampton reached the Junior showdown in 2015 but were beaten by exciting African side Right to Dream who went on to successfully defend their crown the following year. “Charlton Athletic won the Junior competition in 2000 when they beat Manchester City. Scoring a double in backing the competition is Toomebridge company Creagh Concrete, manufacturers and suppliers of an extensive range of concrete products, who kicked off their support last year. Seamus McKeague, co-founder of Creagh Concrete, said "We are delighted to be involved with SupercupNI and congratulate the Committee on the excellent work they carry out at County level to enable our best young players to pit their skills against some of the best football teams in the world right here on their own doorstep." The tournament, which features a new Under-13 mini section this summer, kicks off on Monday, July 23, running through to Friday, July 27.